Sydney’s first Government House overlooking Sydney Cove was built for Governor Arthur Phillip in 1789. 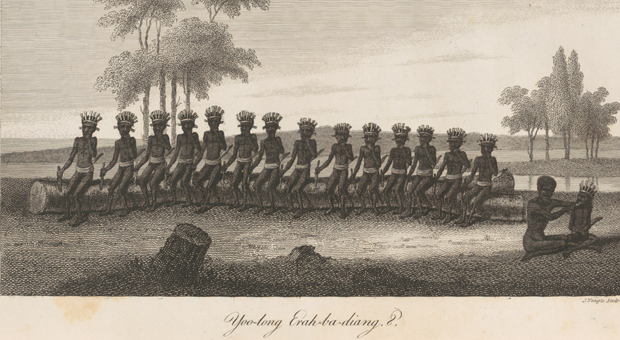 The building and its grounds were an important place of early contact and cross-cultural exchange between Sydney’s Aboriginal population and the colonists, as expressed through the relationship between Bennelong, a Wangal man, and Governor Phillip. 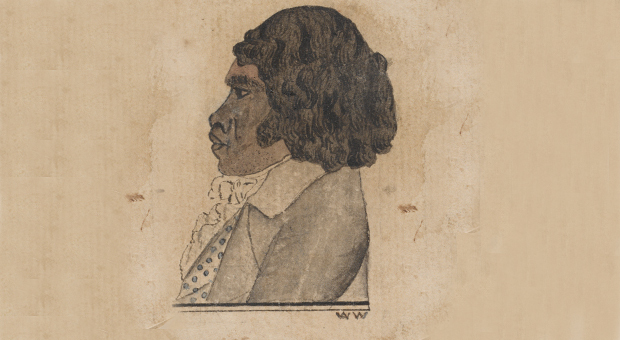 In November 1789, Bennelong and another Aboriginal man, Colebee, were captured at Manly under Phillip’s orders and were held at Government House. Yet Bennelong maintained cordial ties with Phillip after he escaped. 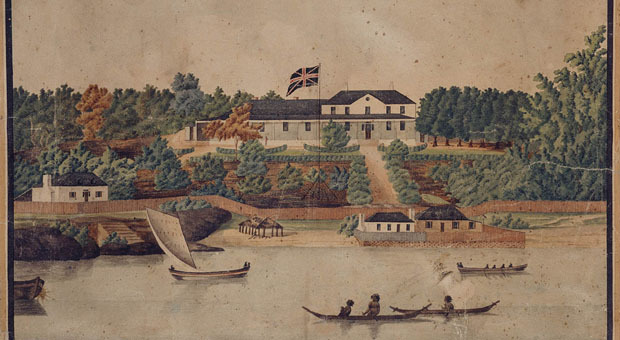 He often dined at Government House with his wife Barangaroo, and a number of Aboriginal people were buried within the gardens at his behest. They included Barangaroo and her infant daughter Dilboong, and Ballooderry from the Burramattagal clan near Parramatta. In 1983, archaeologists investigated the site of First Government House as part of a proposed redevelopment of the area. No trace of the Aboriginal burials were located but they found other evidence of Aboriginal use of this important historical place. The most striking was a piece of dark green bottle glass that appeared to have been manufactured or ‘knapped’ by Aboriginal people in a similar fashion to the way that they made stone tools. Archaeologists also found a gunflint that appeared to have been modified in a similar way, but this could also have been done by Europeans. The archaeologists also noticed that the lime mortar used to bind together some of the sandstone blocks of Government House contained shells like oyster and cockle. They suggested that these shells may have come from Aboriginal middens, which are known to have been quarried by early Europeans in Sydney to produce lime mortar. But early settlers also gathered shells from natural shell beds, so this remains uncertain. 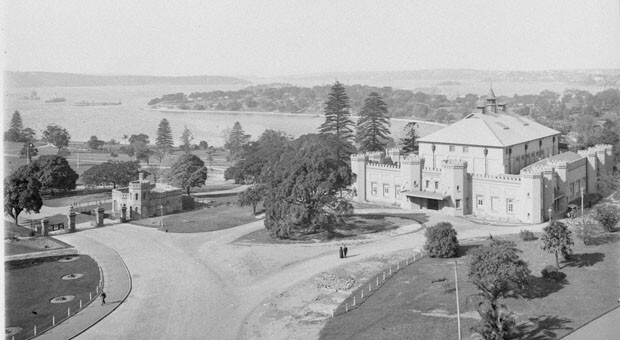 The First Government House site is now the location of the Museum of Sydney. Some of its foundations are preserved and visible at the entry to the museum, and the artefacts found during the archaeological dig are in its collections and on display. First Government House is a very significant place where historical records and archaeological evidence combine to give us an insight into the early interactions between Europeans and Aboriginal people in Sydney. H Proudfoot, A Bickford, B Egloff and R Stocks, 1991. Australia’s First Government House (North Sydney; Allen & Unwin).